As you may have figured out by now, I lost my motivation to update the blog following Tim’s surgery earlier in the summer. I’m hoping to rectify my long, long absence starting today and finally get this blog caught up-to-date. Tim did very well during his recovery from neck surgery, and his surgeon released him on July 29. Next on the agenda was a course of physical therapy to strengthen his neck and shoulder muscles in order to protect his spine. Tim was able to find a wonderful physical therapist in Fort Collins, Colorado, and we moved to the Residence Inn in Fort Collins to be closer to the facility. Most weeks he was there for three sessions, and he seemed to improve every day. It was a very hot summer in the Northern Colorado foothills, and we were not inclined to get out and do too much. The focus of our summer was Tim’s health and getting him back to normal. 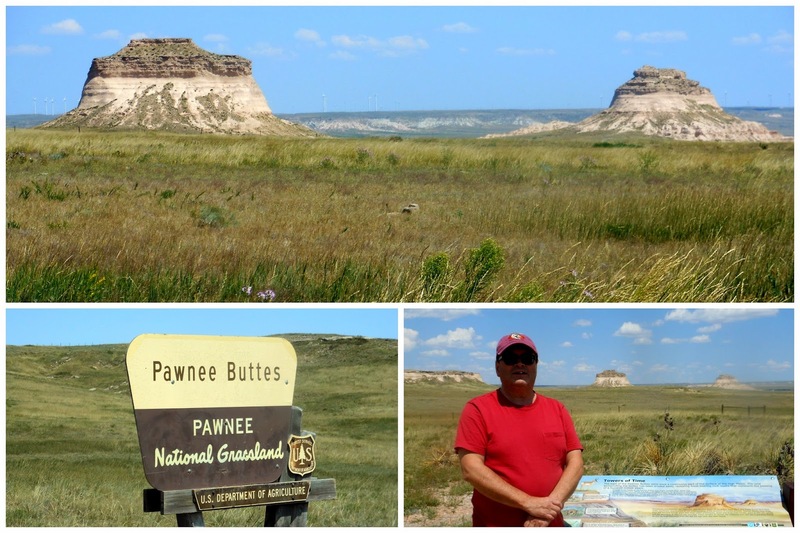 We did take a few day trips, however, including one to Pawnee Buttes northeast of Greeley, Colorado. Although we were away from the RV, we enjoyed our stay at the Residence Inn because of Natasha, our housekeeper who made our stay very special. Natasha fell in love with Kitty the day we checked in. She spoiled her with new toys and played with her almost every day. Natasha was so much fun to be around, and her affection towards Kitty meant a great deal to us. Since Tim retired in March, he has been interested in providing museum services contracting for national parks. His first contract was in April-May at Big Thicket National Preserve in Texas, and his second was at Florissant Fossil Beds National Monument in Colorado, where he volunteered for a week during our first month as full-timers (I’ll write about those experiences in future catch-up posts). At the end of July, Tim received an offer to provide museum services at Chickasaw National Recreation Area in Oklahoma. The project was the completion of the park’s annual museum reports, which were due the first of September. What was he to do? Tim was interested in the project, but he would be going through physical therapy, and that was his priority for the month of August. Was there a way he could make both things happen? We put our heads together and came up with a solution. Tim could work remotely at a National Park Service office in Fort Collins and fly to Oklahoma for a week of hands-on work. If he left on a Wednesday and returned the following Tuesday, he could still manage two physical therapy sessions each week. Since this travel would take place near the end of his course of treatment, his physical therapist bought into the plan, as it would show her how far he had progressed after being away for almost a week. Everything came together as planned, and Tim flew to Oklahoma City, stayed in park housing, completed the annual reports and flew back to Colorado to complete his final therapy sessions. Amazingly, everything worked out, and Tim was released by his physical therapist on September 5. We left the hotel in Fort Collins, and Colorado, two hours later! It was time to move on with our lives and get back to our definition of normal. It felt so good to be back on the road!